In its annual gift-giving tradition, LEAP, LLC, leads the way for the annual LEAP toy drive, helping to ensure brighter holidays for disadvantaged area youth. Washington, DC, December 24, 2015 --(PR.com)-- Last week, Lawrence Executive Alliance of Professionals (LEAP), LLC, spearheaded efforts for its annual toy drive for disadvantaged children in the D.C. Metropolitan Area. 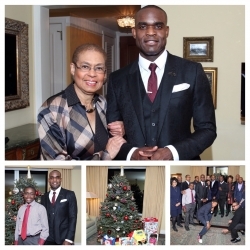 Engaged annually in gift-giving efforts that will benefit families and communities that need it most, LEAP is driven by what its CEO, Dr. Clayton Lawrence, considers to be one of the most important and rewarding parts of the holiday season: making children happy. This year, LEAP went a step further to include other young people in on the gift-giving. LEAP, through both LEAP, LLC, and LEAP Foundation DC, are organizations that maintain a focus on the mentorship of young people. Dr. Lawrence felt that this year’s toy drive would be an excellent opportunity for youth that have been fortunate enough to not come from challenging and underprivileged backgrounds to be a part of the event. “When you can instill the importance of serving and helping others in the next generation, especially in youth that may not have had to overcome the challenges that some who we are giving to each year have experienced, it ensures that we are empowering future generations to find the power in kindness, compassion, and servant leadership. These are qualities that the world needs more of and we look to impart them to young people every chance that we get,” Dr. Lawrence concluded. To learn more about LEAP’s annual toy drive, drives from previous years, and how you can help support next year’s event, visit www.leap4staffing.com.